Once again, Charley Pride is not a favorite of mine, when it comes to Country Music Recording Artists. Still I learned, many years ago, that few artists produce great songs in vast quantities. I have long since found myself to be fans of songs rather than artists. Any artist can produce a great song and even if said artist only produced one, if it is truly great, it is worthy of immense appreciation. This is why I know so many songs by heart, but few of the names of the recording artists that put them out. 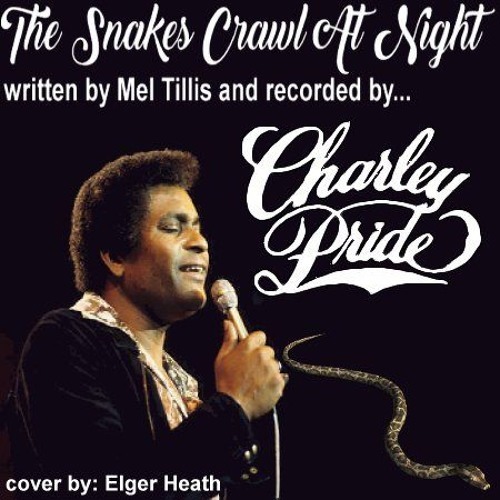 Charley Pride recorded a nice little number in 1965 called 'The Snakes Crawl At Night'. This song did not anchor itself into my mind, right away, but sorta grew on me, as they say. Written by Mel Tillis, it's catchy little hook line, 'The Snakes Crawl At Night' was very effective and, under close examination, I found the lyrics, quite emotional and telling. It's an easy song to do, but it requires real feelings, in the voice, to make it work. Here is my effort at covering this number.